When deciding on how many first aiders are required, you must carry out a risk assessment. This table gives some basic guidance. 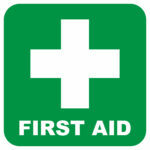 The regulations that apply to first aid provision are the First Aid at Work Regulations 1981. 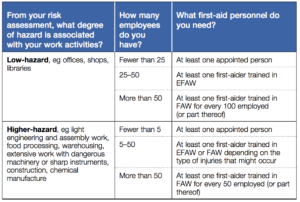 The table shows FAW and EFAW but there are other qualifications that may be accepted. The first aid regulations also specify the contents of a first aid box and first aid rooms. Contact us at ProTrainings for more information.